Drag artist Conchita Wurst—born Tom Neuwirth—has emerged as a favorite to win Austria’s national selection for Eurovision 2012. She recently spoke with Wiwi via e-mail about gender and her Eurovision entry “That’s What I Am.” Here are the highlights of our conversation. Can you tell us a little bit about the character “Conchita Wurst”? First, I wouldn’t call me a character, because I’m a real person. What you see is what you get 😉 Friends would say that I’m a very funny and loving woman. They are totally right! But let’s start at the beginning. I was born in the highlands of Colombia. My parents took me to Germany where I had a wonderful childhood in Berlin. Four years ago I met my handsome husband Jacque in Paris. Love at first sight. We decided to start our new life in Vienna and here we are…still totally in love. In 2007 you placed second on Austria’s Starmania competing as Tom Neuwirth—the name you were given at birth. When did Tom introduce Conchita to the world? How did Conchita Wurst get her name? Conchita has fantastic clothes. Who are your fashion inspirations? Oh thank you hun! My biggest inspiration in fashion is definitely Miss Victoria Beckham. I just LOVE her style! At the same time, Conchita has a beard. What kind of statement are you making about gender? I stand for tolerance and acceptance. The beard is just the optical statement which should help me to get attention…well I think it works 😀 Everybody should be proud of being different, cause we all are! Why do you hope to represent Austria at Eurovision? I love love love my country, cause I think the Austrians are very tolerant and I would be honored to be the ‘statement’ which Austria sends to Europe. What is the message of your Eurovision song? It’s called ‘That’s What I Am’ and the message is that you should be just the way you want to be and, that this is fabulous. There is still a lot of prejudice in the world concerning gender and sexual orientation. 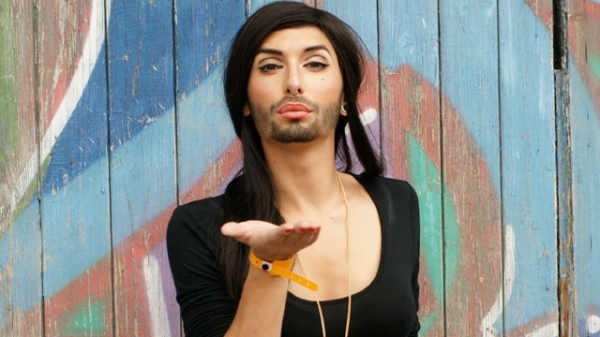 Does Conchita want to inspire people in Austria who are different from their peers? Hundreds of thousands of people have watched the YouTube video of you performing “My Heart Will Go On” on “Die grosse Chance” casting show. Were you as emotional as you appeared to be? You know, this song is one of my absolute favorite songs in the world! Every time I listen to it I start to cry ‘cause of the powerful lyrics and the wonderful melody. Celine Dion was such an inspiration for me. She still is and always will be. Were you thinking about someone special when you were singing it? Do you have a message for Austrians or for Europeans in general? Poll: Who Should Win Austria’s National Selection for Eurovision 2012? Vote Now! THAT’S AWESOME!! Good interview. Fun personality. Nice song. That’s what you are: AMAZING!!!! I respect any woman who can make a beard look good. Congratulations Conchita and good luck in Austria. She’s got a great look! 12 points! it’s a really great song. 12 points from holland! I think her Eurovision entry has potential. I just wish the Austrians had uploaded a better video!! LOVE “My Heart Will Go On.” Can she sing that at Eurovision? Wow! She really would be a statement. Good luck Conchita!